Dave Carter is closing in on new recruits after Moneyfields were beaten 1-0 at AFC Totton in the Southern League division one south. The Moneys boss has been looking around to bolster his squad and now hopes to have a couple of new players on board before the weekend. A single first-half strike proved enough for AFC Totton. The decisive goal arrived when the visitors were caught out by a low cross to the far post leaving the home striker with a simple tap-in. Carter felt his team were a bit unfortunate to lose. He said: ‘It was a very tight game and we were the better side in the second half. ‘Sam Pearce did well for us but we are suffering from playing without a regular striker. Horndean progressed to the second round of the Hampshire Senior Cup with a 3-1 win against Lymington Town at Five Heads Park. Connor Duffin gave the hosts a 23rd-minute lead, beating three defenders before slotting the ball into the net. Though the visitors hit back to level before half-time Horndean regained the initiative in the second period. 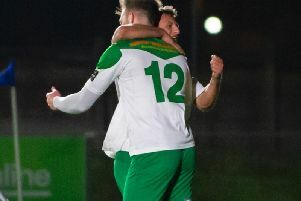 Mark Smith restored the visitors lead on 57 minutes and nine minutes from the end Duffin added a third goal from the penalty spot. United Services Portsmouth edged out Alton 3-2 at Burnaby Road. Harry Potter and Callum Glen put the Sailors in charge before goals either side of half-time pegged them back. The home side netted when Harry Jordan latched onto a pass and fired his shot through the goalkeeper's legs. Mig Dark sealed the Sailors progress with a fourth goal late on smashing the ball in from six yards. A much-changed Baffins Milton Rovers side crashed out 5-2 against Alresford Town at the PMC Stadium. Roly Spencer and Max Davis grabbed the home sides consolation goals. A Jordan Neal goal earned Petersfield Town a 1-0 win at Cove and a home contest against the winners of the Follands versus Fareham in the next round. AFC Portchester lost 3-2 defeat at Team Solent on Monday night. Fareham Town are hoping international clearance will come through in time for Will Capper to appear in Wednesday’s Hampshire Senior Cup tie at Follands (7.45pm). Capper, a central midfield player, has been playing in Spain for the last four years. The Reds are without new midfield signing Lewis Plackett who is in Croatia doing his basic training with the Royal Navy.